Visitor ID Card Design Software provides a complete solution to control, record and track your organization's visitor traffic. Software manage visitor's record and save them to the database while designing visitor ID cards. Gate Pass Generator tool helps you to create Gate Pass and visitor ID cards with option to export visitor records in excel file. You can crop a single or multiple images for your visitor ID card using Image Cropping tool. 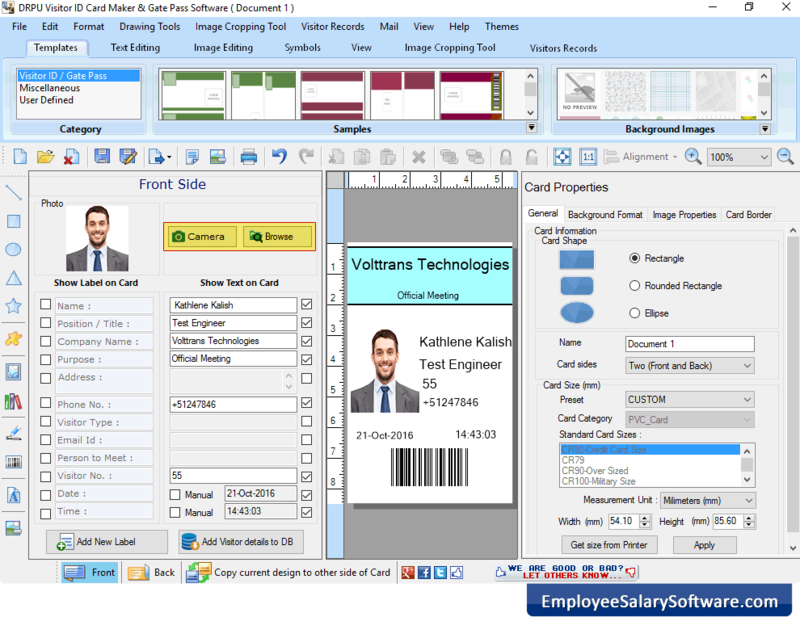 Software is also having Option to include text feature property during visitor ID card designing process. Add Visitor's Details to Database: Provides option to save entire visitor's details to the database. Export Visitor ID Card: Facility to export designed visitor ID cards as Image, PDF file format and as Template. Add Photo on ID Card : Software provides facility to capture the image of visitor using Camera Setting option. Image Cropping Tool : Provides Image Cropping tool to crop images for your visitor ID cards. Search Visitor's Records : Software allows you to search visitor's records according to Name, Address, Company Name, Email, Phone Number etc. as per your requirements. Save Designed ID cards: Facility to save designed visitor ID cards in (.idd) file format for future reference. Color and Background Settings : Software has option to specify the color and background settings of ID card including Solid Color, Gradient, Image, Fill Style and Card Border Settings.